Mary Somerville co-founded the Warren Community Health Clinic and was its executive director until the clinic closed. Without paying patients, the clinic was forced to shut down, sending more than 4,000 people to find health care someplace else. The closure was a big blow for Warren County, an area of the state considered a primary care desert, where doctors are few and patients are often forced to go without healthcare. The county has 0.49 physicians for every 10,000 people – among the lowest in the state, according to the annual 2017 NC Roadmap of Need, a report released by the Public School Forum of North Carolina. Patients traveled from Vance, Franklin and other nearby counties for care at the Warren clinic. 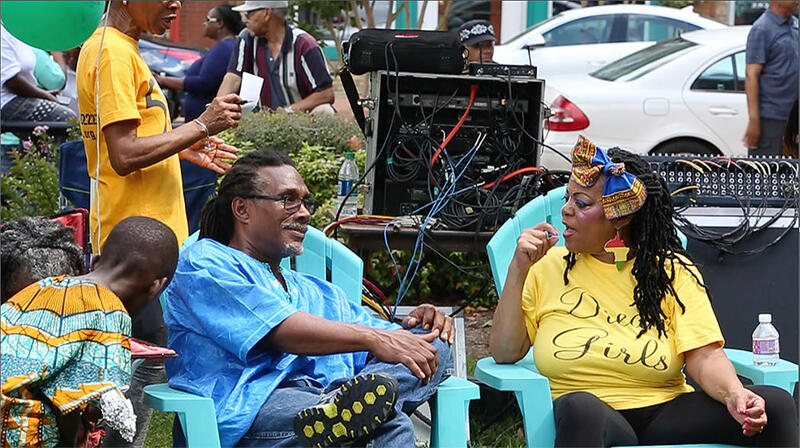 Arthur Pinder, left, at the African American Cultural Festival. Pinder used to visit the health clinic in Warren to treat his asthma. Earlier this fall, I attended the annual African-American Cultural Festival in Warrenton in search of former clinic patients. To meet residents and find former patients of the Warren Community Health Clinic, my colleagues and I pitched a tent at the festival, served up some hot pulled turkey barbecue, and enjoyed the music. Arthur Pinder of Warrenton used to visit the health clinic to treat his asthma. Most of the clinic’s patients were treated for high blood pressure, diabetes, asthma and illnesses related to those ailments, according to clinic administrators. Pinder has a job now that provides health insurance and is being treated at Beckford Medical Center with offices in Warrenton, Henderson and Louisburg. He said he would like to see the Warren Community Health Clinic reopen. “Greatly, and not just for myself,” Pinder said. 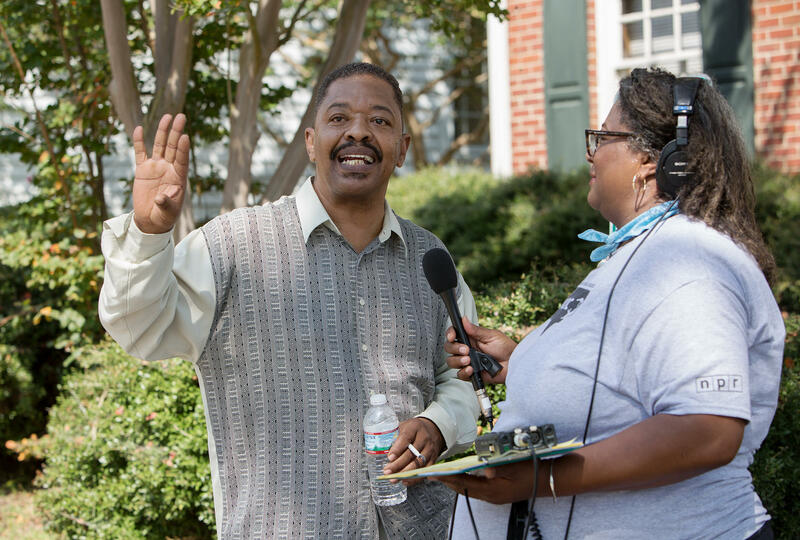 WUNC Reporter Leoneda Inge interviews Sherman Johnson, 60, who moved from Charlotte to Warrenton for a job 40 years ago. Johnson said he currently does not have health insurance. Warren County has experienced decades of hardship and despair. The population sits at about 20,000 residents, and has been shrinking over the past five years. More than half of the population is African American, like Pinder. The Warren County poverty rate is 27.3 percent – more than ten points higher than the overall state rate, according to the U.S. Census data. “We need good news around here,” said Sherman Johnson, 60, who moved from Charlotte to Warrenton for a job 40 years ago. Johnson said he currently does not have health insurance. Johnson’s last few jobs did not offer health insurance leaving him in a difficult situation. He’s not old enough yet for Medicare and North Carolina opted not to expand Medicaid. A sign indicates the Warren County Community Clinic is temporarily closed. Mary Somerville co-founded the Warren Community Health Clinic and was its executive director until the clinic closed. She walked around the festival, shaking hands and giving hugs – a lot of hugs. “How does it feel being out here today?" I asked Sommerville. "I saw several people come up to you and hug you. They remember you from the clinic." Our search continues for former patients at the clinic, which comes at a time when funding for community health centers are in jeopardy across the country.